Where are your OneNote Class Notebooks? The OneNote Class Notebook app used to create and manage class notebooks is being added to the Office 365 app launcher (blogs.office.com). This change is currently rolling out in the US. Some schools were not managing to deploy the Class Notebook app using the recommended method. So worldwide, Microsoft will be making the OneNote Class Notebook app available to all teachers and faculty using Office 365 Education and placing the app in the My Apps page in the App Launcher. When you create a notebook using the Class Notebook app from the app launcher, your notebook will be stored in the teacher’s personal storage in your school – OneDrive for Business (OneDriveFB). Let’s talk about that because initially I had reservations about the move. Now I see that it doesn’t matter too much where the class notebook lives, as long as your teachers now how to use the Class Notebook app, understand the notebook structure and can pick up a few things about using OneNote. I also believe that the announcement of the coming Microsoft Classroom Dashboard will centre around teachers storing notebooks in OneDrive for Business. A virtual class environment needs to be easy to find. Whether it be a site, a notebook, an external service or site. Teachers have enough challenges in the day and finding their virtual learning environments shouldn’t be one of them. This is particularly important for our teachers who we are trying to encourage to use technology more. If a school intranet is well designed, the class environments and sites will be a two or three clicks away. Now thinking of OneNote Class Notebooks, they need to be somewhere that they are easily found, connected to, shared and maintained. In the physical world, a teacher knows where their classrooms are. They know which box or folders they need to take to their next class. Class Notebooks also need to be together in a place that is easy to find for the teacher. If the notebooks are easy to find, then they are easy to manage and share. When a new student joins the class, we want the teacher to know where their notebooks are and know where the OneNote Class Notebook app is to invite that new student quickly and easily. Once the teacher and student are able to connect their devices to the notebook, it really is easy to find all their classes in one place, in the notebook list in OneNote. We want that same One-Place experience for creating and managing notebooks. Now think of the traditional challenges for your IT people. They want to easily and efficiently support their teachers and faculty. For years they have been encouraging their people to store their documents and data in a central place where it can be easily shared, maintained and backed up. Yes, IT people also want to be able to easily find, connect to, share and maintain information systems. In Office 365, our central place to share and store is our Office 365 based Intranet, also known as SharePoint Online. So the real challenge is, how do we get the best of both worlds? Which direction should we go? Notebooks are created using the Class Notebook app. The app saves a new notebook into a document library. It creates the structure of the notebook. Remember this from the “homepage” of a new Class Notebook? Student Notebooks — a private notebook shared between the teacher and each individual student. Teachers can access every student notebook, while students can see only their own. Content Library — a read-only notebook where teachers can share handouts with students. Collaboration Space — a notebook for everyone in your class to share, organize, and collaborate. If Class Notebooks are stored in a document library, where does that document library live? In the site where the OneNote Class Notebook app was run from. This brings us back to our current choices. Use the app from a site in your Office 365 based Intranet. We also return to our goal of making the notebook easy to find, connect to, share and maintain. Class Notebooks ARE easily accessible, whether stored in OneDriveFB or a Team Site. They all have a web address. The Class Notebook web address can be listed on a page in your intranet, linked to using a number of different navigation options (icons, menu items, tiles to name a few). One significant difference between storing notebooks in OneDriveFB and the sites in your Office 365 Intranet is finding the OneNote Class Notebook app. When all my Class Notebooks are stored in OneDriveFB, I only need to visit one place to launch the OneNote Class Notebook app. I can easily create new notebooks, add new members and find the links to my notebooks. When my Class Notebooks are stored in a site in the Intranet, I may need to visit different sites, then find the app. If my school’s Intranet has been designed well, I can quickly and easily find the site and open the OneNote Class Notebook app. I know a few IT people might give me trouble for saying this, but first and foremost we need to make it easy for teachers to find and maintain the notebooks. Out of the box, the OneDriveFB method is easiest for teachers. If your school wants a little more control or wants to add some more collaborative or document management tools alongside the Class Notebook, a well-designed Intranet is the direction to take. Whatever direction your school chooses, it’s a good idea to list all your Class Notebooks together, providing links to them. If you’re going to use your Office 365 Intranet to store your Class Notebooks, think about simplifying the storage. Consider using a new site collection for each year of school. This give the classes plenty of storage and you can archive the content easily. Any content you want to reuse can be copied to the following years notebook. Create a new site collection for each year. For example “2016”. Make sure the OneNote Class Notebook app has been deployed in your school using best practise. Each teacher will visit the 2016 site and run the Class Notebook app to create a notebook for each of their classes. All teachers notebooks will be stored in the Class Notebooks library. Now provide a well-designed page that clearly provides navigation to the Class Notebooks. There are many ways to organise this on a page or with multiple pages – by Departments, Faculties, Subjects and Year/Grade of Study, Class code. This is a nice, shallow structure, with all the notebooks in one place and teachers only have one place to find the Class Notebook. What happens when a teacher leaves and we store our Class Notebooks in our OneDriveFB? Who owns the notebook? OneDriveFB is an individual’s personal drive in Office 365. But it doesn’t mean the contents personally belong to the individual. Much like a personal drive on a company file server, an individual’s OneDriveFB is the property of the organization or school. It’s not too different from a commercial perspective. Many Schools have a policy that content created while under their employment is the property of the school. When a teacher leaves the school, the Class Notebook and it’s contents need to be made available to the new teacher for the class. However, a notebook won’t be visible unless it is shared with you. Teacher’s create their own Class Notebooks and all the permissions centre around using the original teachers account. This is true, whether the notebook is created in OneDriveFB or within a site in the Intranet. Some schools ask me, can we copy the whole notebook to the new teachers OneDriveFB? Not easily and not without disrupting the students. The new notebook would have a new address. Students would need to connect to the new notebook, bring across their own content to the new Class Notebook. Then disconnect the old notebook to avoid confusion. You’d have to go through that process with all students for each class the previous teacher taught. There is too much room for disruption and it could involve a hundred students or more. Another question arises, can we just rename the original teachers account with the new teachers name? No, I would strongly suggest you don’t try this. Office 365 accounts use multiple services and a number of things are tied to the naming of that account. You won’t attempt that approach again, once you’ve spent time talking to Office 365 support to help reverse and resolve the problems that occur. The best approach to hand over the class notebook to a new teacher is to invite them into the teaching role using the Class Notebook app. Don’t try to move the notebook. Students aren’t disrupted. They remain connected to the same notebook, whether it be in OneDriveFB or an Intranet site. Remember, the notebook is easy to find because it has an address. If you need to associate the Class Notebook with the new teacher, add the notebook links to the list of classes the new teacher is responsible for. 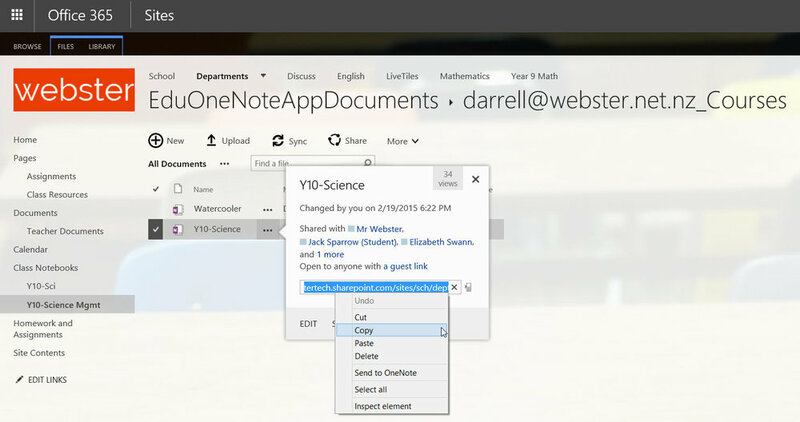 At the end of the school year, the notebook can be moved to an archive or to the new teachers OneDriveFB if necessary. If it is already situated in a site collection for “2015”, it is already archived. Archive the notebooks from the previous classes taught by the leaving teacher. How do you assign a class notebook to a new teacher? Change the password of the previous teachers account. For each Class Notebook, invite the new teacher into the Teacher role using the OneNote Class Notebook app. Does it really matter where a Class Notebook lives – OneDrive or an Office 365 Intranet site? Using the links to the notebooks and a well-designed page and navigation, the Class Notebook can be in either places. In terms of accessing the OneNote Class Notebook app, it is easier for teachers when the notebooks are stored in OneDriveFB. 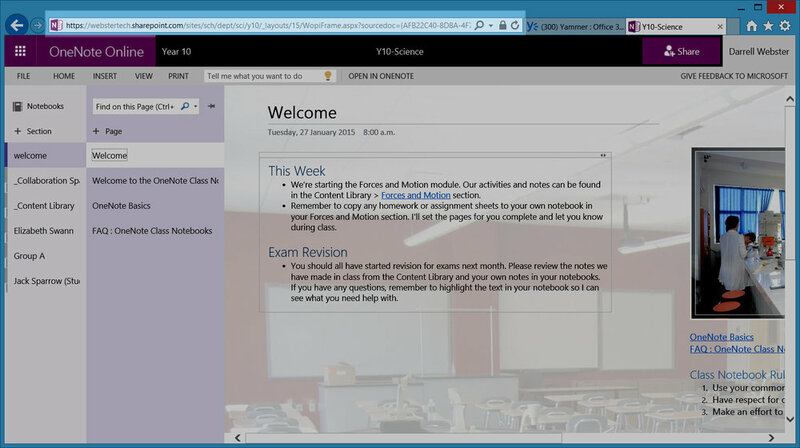 I believe when Microsoft Class Dashboard arrives, it will be leveraging OneNote Class Notebooks stored in OneDriveFB. Watch this space!